The township of Terrigal is located to the east of Gosford on the New South Wales Central Coast. It is about an hour and a half to two hours drive from Sydney (depending on where you live and the time of day) to Terrigal. 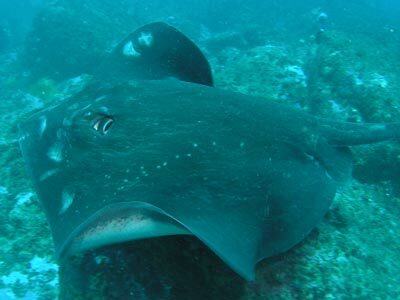 This is a dive that can be done as a day trip, either by itself or combined with an earlier boat dive. 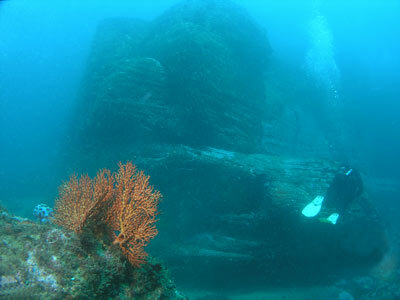 This dive site is located right at Terrigal Haven and is one that I tried to do for over 15 years before I managed to be able to dive there. The main problem is that it is very affected by sea conditions and any sort of swell from the east or north-east crashes right into the entry and exit points. Terrigal Haven (or The Haven) is located a few hundred metres to the east of the main Terrigal shopping/restaurant area. The Haven is the "boat harbour" area where there are a limited number of moorings and a very shallow boat ramp. There is a nice picnic area and a football field as well as a cafe/restaurant and a fish and chip shop. In addition, the Terrigal Dive Centre is located here in the same building as the cafe. The main geographical feature of the area is The Skillion. This is a steep hill shaped like a ramp that leads to a vertical cliff that overlooks the ocean giving fantastic views to the north, south and east (and even the west back to Terrigal). To the north of The Skillion is a low section of coast that gives access to the rock platform. Here it is easy to walk out to the water's edge. 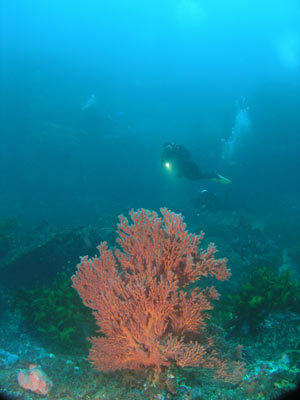 In this small bay is a dive site called Skillion Cave. This is not really a cave, but a crack into the reef that has a large boulder on the top which creates the illusion of a cave. To dive this site, drive to The Haven and take the loop road past the building and car parking area around the oval to the small angled car park just before The Skillion. Park as close as you can to the northern end of the car park. Walk out to the water's edge and check that it is safe to enter (and more importantly), exit the water. The entry point is adjacent to the higher level of the rock platform (shaped _l) and the exit point is the sloping rock to the left of this location, about 10 metres away. There are alternative exits points to the north of the cave and you can also swim all the way back to The Haven. This apparently takes about one hour. Once geared up, walk across the lower section of rock platform to where the higher rock platform meets the water. Put your fins on away from the edge and quickly walk the few metres to the drop off and enter the water. Swim away from the rock platform. Once you are all in the water, swim to the north for about 50 metres till you are just off the next small point. Make sure you are out at least 30 metres from the shore before you descend. Once on the bottom, you will find that the depth is probably about 8 metres or so. If you are at this depth, head to the east and drop over the wall. You will soon find yourself at about 15 metres. Follow this wall to the north and in a short time the direction will change to north-west and then west. This is the entrance to the cave. 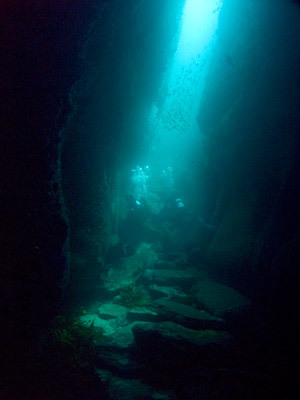 Skillion Cave is not really a cave, but a crack that extends back into the reef. 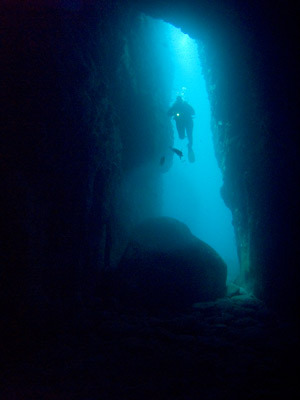 Depending on visibility, you may already be able to see the other side of the crack that forms the cave. As you get further along, you will see the walls get closer together and then it will get darker. Look up and you can see a huge boulder that is lodged in the top of the crack. This forms the roof of the cave. 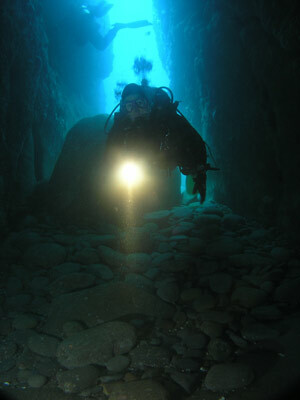 The depth is now almost 20 metres and the bottom drops a little as you enter the cave. Inside the cave there are small overhangs to both your left and right. There are normally a couple of blue gropers in here, one a large blue male the rest brown females. There are also normally lots of fish, things like ladder-finned pomfret and yellowtails. After you have gone about 15 metres from the entrance, the floor of the cave slopes up. It can be surgy here so you may need to turn around at this spot. I have not been back much further as on the day I dived here it was quite surgy. Go back out the cave and turn left to the north. The wall is very shear here, although there is a sort of ledge a bit shallower at 10 metres. This is a good place to spend the last part of the dive so do not go there now. Follow the bottom of the wall to the north. The bottom varies between 15 and 18 metres, although it does get deeper if you go east away from the wall. After 30 metres or so, the wall turns to the left towards the west. It goes in this direction for about 20 metres before again turning to the right and north. All along the wall there are sea squirts and gorgonias. Some of the gorgonias are quite large, all are very colourful. The wall continues to zig-zag as it follows the rock platform. On a shore dive you can actually keep following this wall all the way back towards the shelter of The Haven and exit back near the boat ramp if you are good on your air. Otherwise, you will need to turn back soon and go back towards the entry point. If this is your first time here and you have no-one who has dived here a few times, it is better to be safe than sorry and turn back with a lot of air in reserve. You need to make sure you have at least 50 bar when you start your exit in case you need to work hard as you get up onto the rock platform. Follow the wall back towards the Skillion Cave. As you go, you can ascend to the top of the wall and explore the shallower ledge here. As mentioned, this varies in depth, but for the most part it is 10 metres or so. You will come back to the cave. 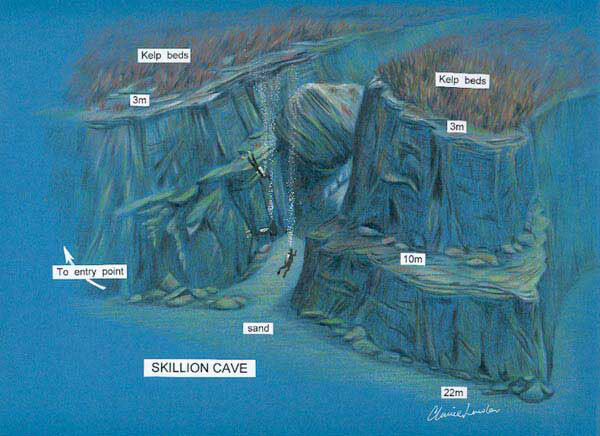 As you can see from the top, the cave is really a crack that has a large boulder in it creating a cave or swim-through. Continue on and back track past where you caome over the wall. Soon you will come to a wall that heads off to your left (east). Turn right and follow the wall as it gets shallower. Keep going till you are only in a few metres. If you are not experienced with this site, you will need to ascend to the surface and check your exact location in relation to the exit. It may be better to go back down and only come up as you climb onto the rock. This dive is not for the inexperienced unless you are with a very experienced diver and also with a diver who knows this dive site. If you have a lot of experience, then can easily dive here but you need to take notice of how you get in and out and keep a good memory of the route you take so you can find your way out.